It is the sort of thing nightmares are made of. Your presentation went badly. This white paper gives you a jump on the writing process. The Spur Group does lots of executive speech writing. In this whitepaper, we identify five of the most common mistakes we see in executive presentations and we offer specific techniques you can apply to avoid these mistakes. We help position you so your next presentation drives the business impact you need and builds your reputation as a compelling representative of business vision. This report is yours with no obligation. 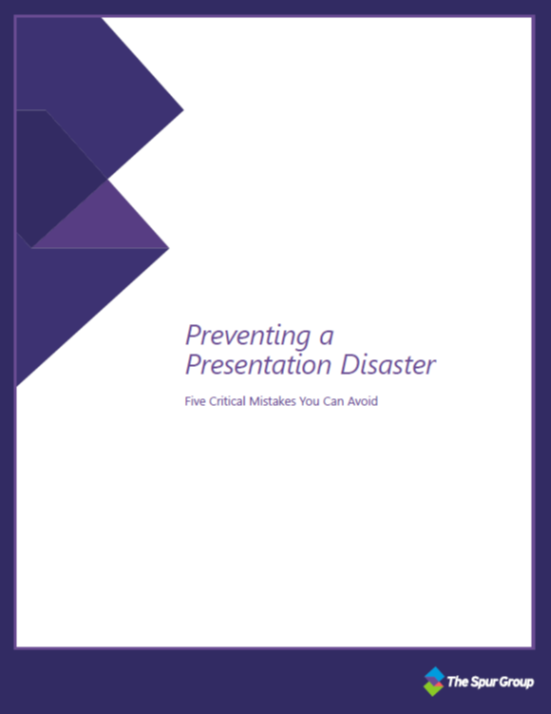 Simply sign-up to download Preventing A Presentation Disaster. "The Spur Team always came super prepared, and was extremely knowledgeable about our technologies and product mix. Their ability to absorb complex concepts, up-level information for various audiences and deliver high impact presentations has proven Spur to be an invaluable partner to Cisco." Download a free copy to learn how to build more compelling presentations.